On Sunday night in Tokyo, Japan, former UFC and Bellator lightweight champion Eddie Alvarez made his ONE Championship debut. Alvarez’s debut fell on the stacked ONE: A New Era card, where he battled Russian juggernaut Timofey Nastyukhin in the final, first-round bout of the ONE Lightweight World Grand Prix. Both fighters entered the ONE Championship cage looking to bounce back from recent losses. Eddie Alvarez last fought in July in the UFC’s Octagon, where he came up short against Dustin Poirier. Timofey Nastyukhin, meanwhile, last fought in September, when he was stopped by the surging Saygid “Dagi” Guseyn Arslanaliev. In the end, this fight ended in a jaw-dropping upset, as Timofey Nastyukhin put the former ONE and Bellator lightweight champion away in the first round. Through most of the first round, it was the Russian pressing forward. As the round wore on, he began to find his range and land on the American. Then, in the waning moments of thee first round, he put a decisive end to the contest, smashing Eddie Alvarez against the cage until the referee could watch no more. With this victory, Timofey Nastyukhin rebounds from his recent loss to Dagi in the most impressive fashion possible. 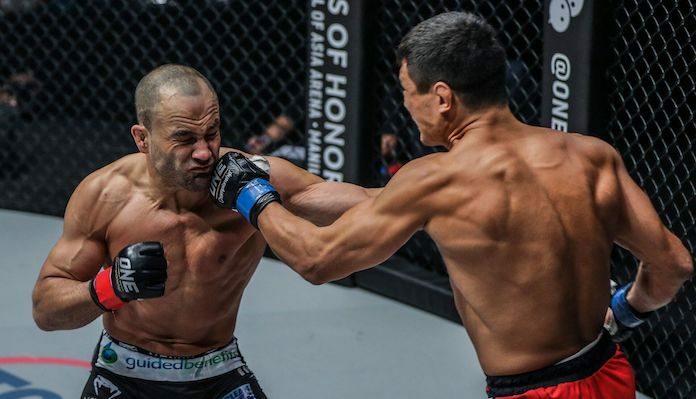 Eddie Alvarez, meanwhile, comes up short in his ONE Championship debut. This article first appeared on BJPENN.COM on 3/31/2019. ← UFC Philadelphia main card highlights: Justin Gaethje delivers brutal knockout!